Celebrate Mosquitos? Where Else but Texas!!!! But it is true. 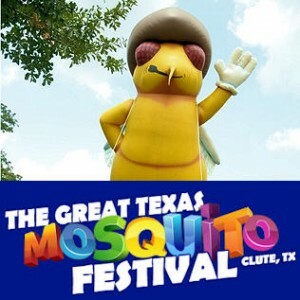 In Clute, Texas (55 miles southeast of Houston, near the coast) they not only celebrate them, they have a festival named for them – The Great Texas Mosquito Festival. Why? Let’s take a look. Celebrating 37 years, the festival is scheduled for July 27, 28, 29 and attracts 13,000 plus visitors a year. In 2014 The Top Events USA named it as one of the Top 20 events and festivals in and around Houston. created, honestly, to encourage tourism in the city of Clute, it includes a “Mosquito Chase” 5 K Run and 600 meter Kids run on Saturday, Mosquito Calling and Mosquito Legs contests. But why mosquitos? Have you not been to the Texas coast? The story (tale) goes that a mosquito, “Will-Man-Chew”, came across Clute in 1981 and liked what he saw. Deciding to settle there, he brought together his ambassadors or “Swat team” to every year present three fun-filled days of special events, games, food, carnival rides and contests, craft booths, cook-offs and much more, honoring him and his fellow mosquitos. That’s the story and they’re sticking to it, in fact, you can meet Willie at the festival – unless, of course, you are wearing bug spray. Go online to www.mosquitofestival.com for all the information you need on this unique Texas festival and make plans to visit Clute. Especially check out their music lineup – over the years there have been some notable names, such as Asleep at the Wheel in 1982, Selena in 1994, Three Dog Night in 1996, Ronnie Milsap in 2000, Marshall Tucker Band in 2005 and The Texas Zydeco Band in 2008. Wherever you head in Texas this summer don’t forget your sunscreen, bug spray and Rules of the Road. Safety on the Texas highways is our priority. Log into WirelessDefensiveDriving.com for all your safe driving information or just to dismiss a ticket.